JewelQuest is an application published by Today Solutions. You probably have not heard of this company before, because it only develops and distributes adware. In fact, our malware researchers have reasons to believe that this is a fictitious company that is controlled by people who have developed other unreliable advertisement-supported programs that require removal. Read this report to learn more about the unreliable adware and to find out how to remove JewelQuest. Even though HitTheLights, Websteroids, Blasteroids, Finance Alert, or other similar applications –all of which we recommend deleting – are not clones of JewelQuest, there are no doubts that these programs have been created to serve the same purpose. As soon as you install these applications from their official websites (e.g., playjewelquest.com), you are bound to discover various random banner adverts and pop-up offers suggesting different services. Believe it or not, you must delete JewelQuest to disable these ads. The advertisements displayed by JewelQuest camouflage links to third-party sites. It would not be fair to state that all of these sites are unreliable, but you must realize that you will evade certain security risks if you just ignore the suspicious ads. Of course, these ads will keep flooding unless you delete JewelQuest, or you terminate the process called JewelQuestService.exe. Needless to say, the latter option is temporary, and, in order to get rid of the ads for good, you will have to delete the advertisement-supported program. Most computer users, who find that they need to remove JewelQuest, detect other undesirable programs as well. If you are not sure if you can detect all threats yourself, we can recommend a tool that will identify all computer infections and unreliable programs in no time. The tool we are talking about is the SpyHunter’s free malware scanner. Install this tool, and we are sure that soon enough it will become clear which apps require removal. If you want to remove JewelQuest and other threats automatically, all you have to do is upgrade the free scanner to a reliable malware remover/security tool. There is no doubt that automatic malware removal software, such as SpyHunter, can delete JewelQuest most quickly and efficiently. Of course, removing adware is not the only reason why you should install this software. You must install it to delete other active threats and protect your operating system against the attacks of schemers who might target you in the future. We also recommend this software to those users who decide to remove JewelQuest manually. Locate the Start icon on the Taskbar and click it to open a menu. Open Control Panel and double-click Add or Remove Programs. In the menu on the left select Change or Remove Programs. Click the undesirable program and select Remove. Open Control Panel to find more options. 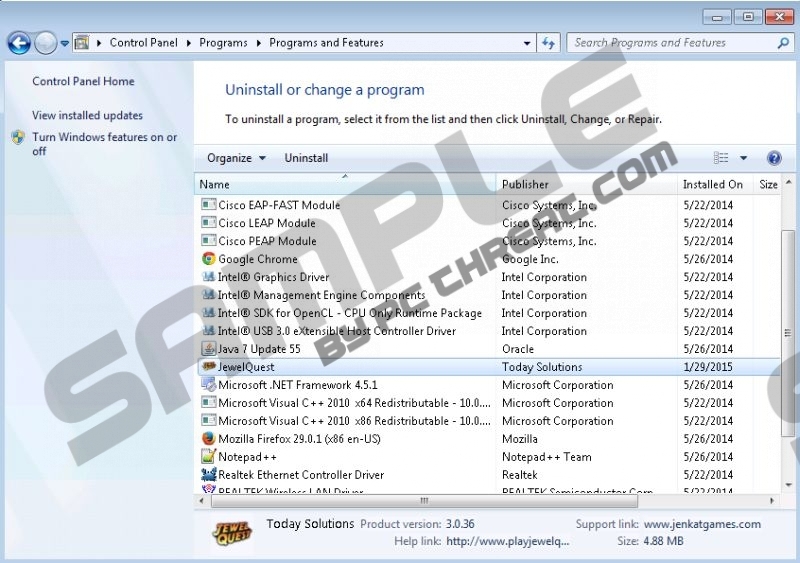 Go to Programs and click Uninstall a program. Access the Metro UI screen and open the Charm Bar. Click the Search icon and enter Control Panel. Quick & tested solution for JewelQuest removal.